This May, Christian Aid week features the stories of expectant mothers Tenneh and Jebbeh and their nurse, Judith. These women are from Sierra Leone, the most dangerous country in the world to give birth in. Pregnancy should be a time of excitement and anticipation while rooms are readied and bellies grow. It’s a time of celebration for many, as mothers, families and communities anticipate welcoming new life into the world. There is also fear. Fear of the unknown and of the birth itself. We are fortunate in the UK to have access to the NHS. We have access to midwives, support at the end of a phone and in an emergency we can rely on ambulances to take us safely to clean, well-equipped hospitals when labour begins. Despite these resources, pregnancy can still be difficult, challenging and dangerous at times. Now imagine going through all of this in the knowledge that your sister recently died in labour and there was no medical support nearby to save her. Imagine that you yourself went through a traumatic birth and tragically lost your baby. Now you are due to give birth again, but nothing is different this time. You have no idea if your child will survive. This is the reality for Jebbeh and Tenneh from Sierra Leone. Our partners, RADA, have supported Jebbeh and Tenneh’s community to identify their needs leading to the training and installation of Nurse Judith and health advocates in the community. RADA is also supporting the community to establish savings groups, which have funded the construction of a new health centre. There is still much to do and other villages who do not yet have a nurse like Judith. Stand together with mums like Jebbeh and Tenneh this Christian Aid week 12th-18th May by holding a church collection, collecting door to door or at a local train station, host a Big Brekkie for your community, or a bake sale. The fundraising options are endless, to get involved you can order resources here or get in touch with your regional office to discuss your ideas and get support from our team. Order your free resource pack. Find contact details for your regional office here. 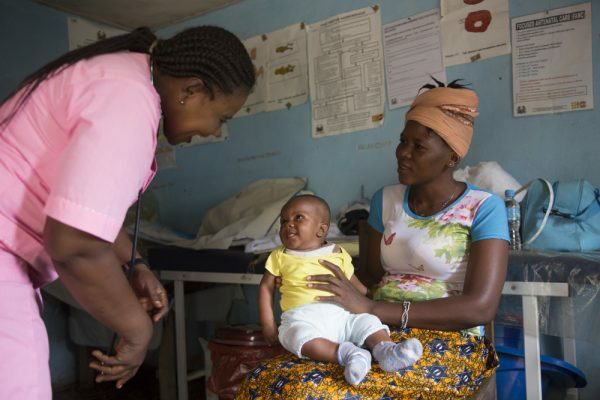 Help us to extend the support available to expectant mothers in Sierra Leone.